South Indian Dance in Critical ContextFeaturing Dr. Yashoda (Hyderabad, India)Prof. Hari Krishnan (Wesleyan University)Prof. Davesh Soneji (University of Pennsylvania) This event is a combination of lecture, performance, and interactive discussion with three scholar-artists deeply committed to critical perspectives on the history and practice of dance in modern South India. 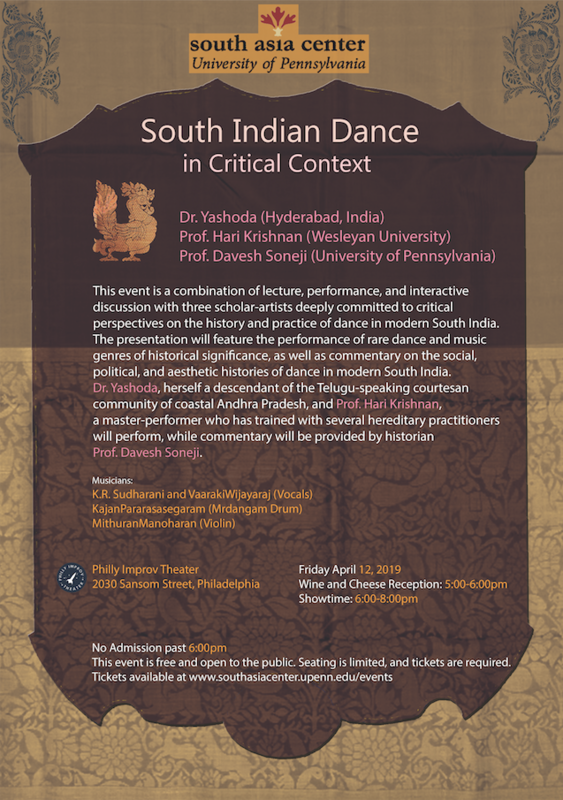 The presentation will feature the performance of rare dance and music genres of historical significance, as well as commentary on the social, political, and aesthetic histories of dance in modern South India. Dr. Yashoda, herself a descendant of the Telugu-speaking courtesan community of coastal Andhra Pradesh, and Prof. Hari Krishnan, a master-performer who has trained with several hereditary practitioners will perform, while commentary will be provided by historian Prof. Davesh Soneji.Musicians:K.R. Sudharani and Vaaraki Wijayaraj (Vocals)Kajan Pararasasegaram (Mrdangam Drum)Mithuran Manoharan (Violin)Friday April 12, 2019Wine and Cheese Reception: 5:00-6:00pmShowtime: 6:00-8:00pmAt Philly Improv Theater2030 Sansom Street, Philadelphia No Admission past 6:00pmThis event is free and open to the public. Seating is limited, and tickets are required. Tickets available here.